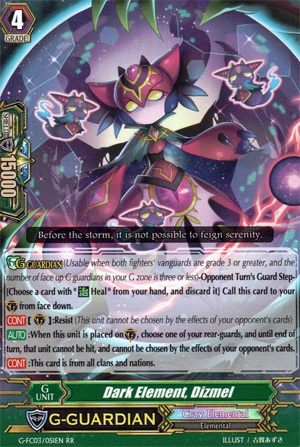 [G guardian] (Usable when both fighters' vanguards are grade 3 or greater, and the number of face up G guardians in your G zone if three or less)-Opponent Turn's Guard Step-[Choose a card with "HEAL" from your hand, and discard it] Call this card to your (GC) from face down. [CONT](GC):Resist (This unit cannot be chosen by the effects of your opponent's cards) [AUTO]:When this unit is placed on (GC), choose one of your rear-guards, and until end of turn, that unit cannot be hit, and cannot be chosen by the effects of your opponent's cards. [CONT]:This card is also of all clans and nations. I got this confused with Scryew all the time. But anyway, this card. It's a G Guardian meant for generic purposes, but boy is it a good one. When placed on G circle, one of your rear-guards gets Resist until end of turn. Oh, and for the whole turn, the chosen rear-guard cannot be hit in battle either. Checks people trying to get off Commander Laurel by attacking a rear-guard as long as you have a Heal to spare, and it helps decks like Murakumo and Neo Nectar by keeping a rear-guard alive to clone. Apart from that, this G Guardian doesn't go far in generating any new shield for your vanguard, just the 5k more than the Heal, but that's hardly a reason not to run it until a second option becomes available. Get at least one for your deck to check counters until GBT07 gives you something better. I know I'm getting something better, hehehe. And here we come to the reason we get 8 more cards in your G-Zones officially. Works like Stride, just that you pitch a Heal from your hand when both are at Grade 3 and you're at GB3 or lower. Yes, this works like a Stride as well and counts towards GB1 on out. Anyway, it basically makes it a lot easier to guard against Stride attacks, plus it gets around Glory clone effects, seeing as you don't put it in the Guardian Circle from your hand. Also, unlike normal units that you use to guard with, this goes back to the G-Zone face-up. Okay, now that we got the prelims out of the way, what does Dizmel give us? Well, Resist is nice, Daikaiser-like effects can't punch through it. And you can give one of your rear-guards, Silent Tom and the like, perfect defense and Resist for the whole turn. Being a Cray Elemental, this can go into any deck, plus it FINALLY gives us some defensive options that we didn't have before. Hooray! G-Guardians finally make it so that Strides are no longer "Perfect Guard or No Guard". Yes, it doesn't stop a Stride attack, seeing as it gives your Vanguard a total power of 26000, but it makes it a lot easier to guard. So, yeah, this is good.